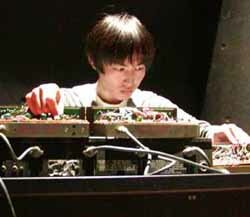 Inspired by his visits to the Paris Peking record shop, Utah Kawasaki began producing music in 1994, and between '94 and '95 released so many titles on tape that he himself lost count. In '96 he released a solo CD on Zero Gravity, a sub-label of Transonic Records. Since then he has contributed to a number of compilation CDs. Astro Twin, a duo with voice performer Ami Yoshida, is one of his main projects. The duo's first album Astro Twin / Cosmos (a 2-CD set shared with Cosmos, the duo of Sachiko M and Ami Yoshida), was released on F.M.N. Sound Factory in 2002. Kawasaki toured Europe in October 2000 with the group Mongoose, which he formed wtih Taku Sugimoto and Tetuzi Akiyama. He also put out a solo CD utah.mod.radi. in 2002 on Radio, a sub-label of 360°.